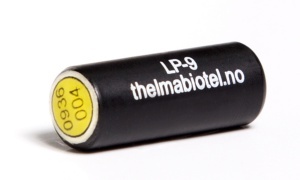 The Thelma Biotel 9 mm acoustic transmitters are intended for use where both size, output power and long transmitting life is crucial. Manual tracking or automatic monitoring of larger salmon smolt migrating out fjords is a potential area of use. The customer specifies pulse delay or coded ID and type of encoding scheme, transmitting frequency and minimum and maximum random delay for ID transmitters. The 9 mm transmitter is available with a wide range of power options for optimized battery life and power output. The 9 mm transmitter comes in two versions, the 9 and the 9L. 9L is intended for use where battery life is important, and 9 is ideal for use where size is prioritized. The full range of low, medium and high power output is available for both variations of the 9 mm tag. The Thelma Biotel 9 mm acoustic transmitters are intended for use where both size, output power and long transmitting life is crucial. Manual tracking or automatic monitoring of larger salmon smolt migrating out fjords is a potential area of use. The 9 mm transmitters are delivered both as continuous pingers and ID transmitters. The customer specifies pulse delay or coded ID and type of encoding scheme, transmitting frequency and minimum and maximum random delay for ID transmitters. Four versions of the 9 mm transmitters are available: LP9, MP9, MP9L, and HP, meaning low, medium, and high power, respectively. The Thelma Biotel transmitters are energy efficient and versatile platforms developed for a wide range of studies on aquatic species and submerged equipment. The various transmitters are produced in four main capsule diameters: 7.3 mm, 9 mm, 13 mm, and 16 mm. Transmitter lengths depend on the possible addition of sensors, output power and the desired active lifetime.